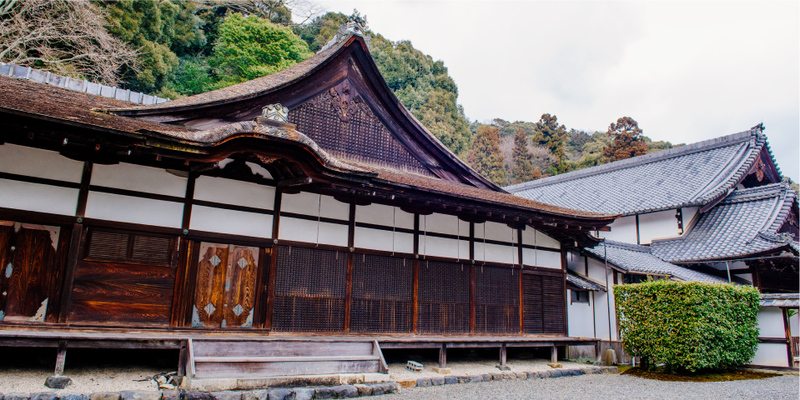 The Buddhist cleric was one of the senators of Miidera-Temple, built by Yamaoka Doami, a warrior who served Toyotomi Hideyoshi in Keicho 6 (1601) and was a monk of Miidera-Temple. It is designated as a national treasure as a representative remembrance of “Shoinzukuri” which is born in the Muromachi period. It has realized the architectural space which realized the service ceremony of the medieval society until it reaches the detailed design with the crossing between 7, between the beams 6, with the persimmon turret building. Between the upper seat of the guest house, Oshiita (floor) and Chigai-dana (alcove shelves) are placed in the front, a book table is held on the north side, and a nursery school and a push plate are provided between the upper high stages protruding on a broad veranda on the south side I will. 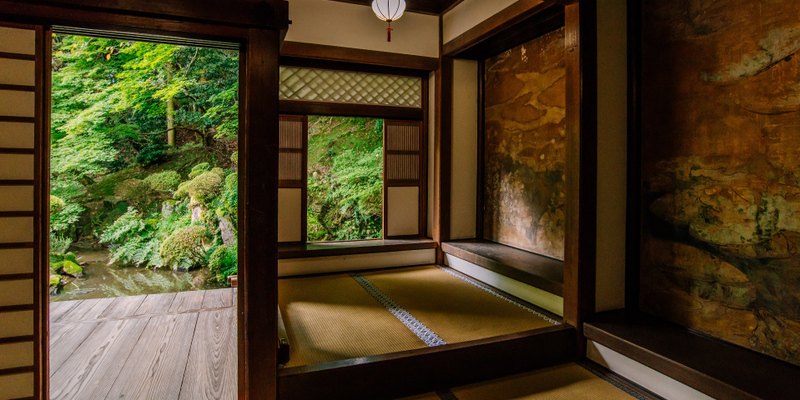 Such an indoor unit is called “a room decoration”, it is formulated as a device indispensable for a school building, and it was taken over to the seat of a Japanese house. 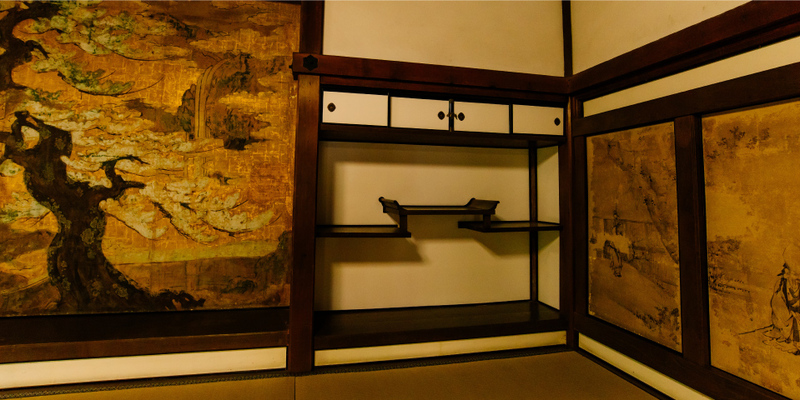 During the upper seat of the guest house, next time, it was decorated with barrier paintings by Kano school, including Kano Sanraku (1593 – 1635), and it is designated as an important cultural property as a group of work that conveys the characteristics of the Kano school in late Momoyama. 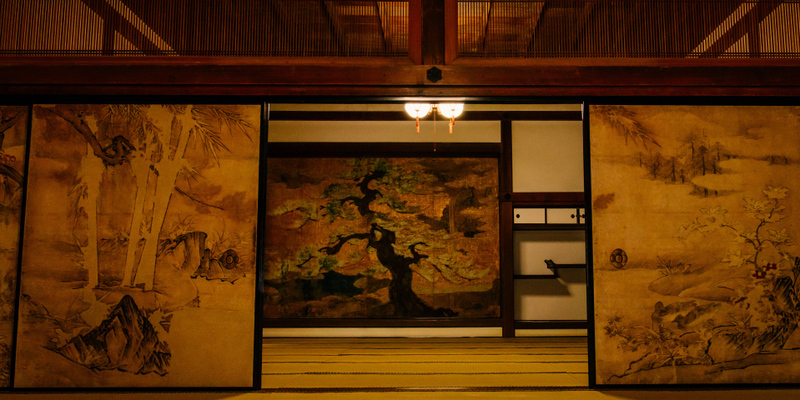 Particularly in the upper floor of the upper floor there is a mountain water falling down the waterfall, centered on the pine which spread the branches leaf which can be said to be typical of the Momoyama style, is known as a valuable work showing a unique personality among the Kano school . 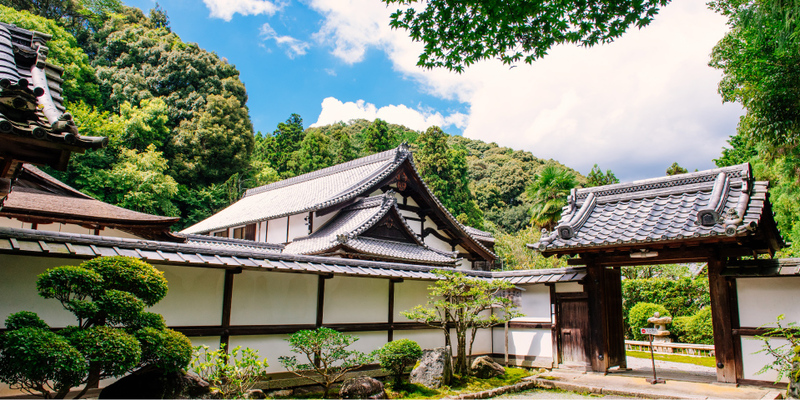 Kojoin’s garden, which was built in the late Muromachi period, is designated as a scenic spot. When you go out to the “a broad veranda” from the interior, the water border of the pond is approaching so as to touch the falling edge. As if the landscape depicted in the barrier painting continued to the external garden, the building creates a close sense of unity that the building embraces the garden. In the boarded “a broad veranda”, by creating only one pillar that dares to support the eaves, it creates an open space to blow open. You can feel the symbolic high space condensing Japanese culture that is pure, bright, and rich in expression. Kojoinkyakuden takes advantage of exquisite balance feeling such as adopting a bilaterally asymmetrical design in consideration of the living behavior of visitors, the flow of time.For the modern people who live surrounded by diverse architecture, Kojoinkyakuden , where you can experience the high artistic architectural space, will be able to draw on the creation of the future “living” Japan As a source of the japanese architectural culture, it is also an architecture with exellent modernity.